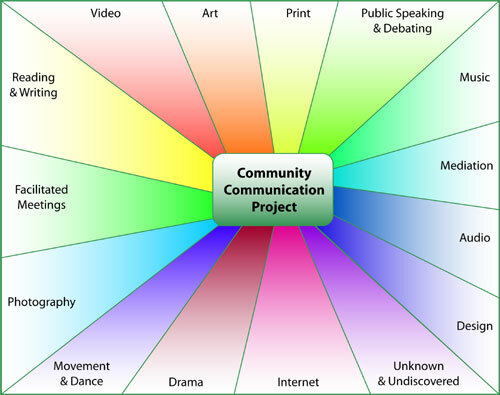 The Community Communication Project is an attempt to find better ways for communities to interact, to share information — to communicate. Ideally, this would lead to the identification or discovery of a model (a group of principles or structures) that could scale to fit a particular size community (say, a campus or a neighborhood or a city and so on). Imagine trying to solve a community problem and being able to tie into the most appropriate, effective, and efficient modes of communication you need: whether printed newsletters and flyers, video and television, web and email, facilitated group meetings, radio and telephone, personal contact, and so on. Imagine developing a comprehensive, or unified, way for our communities to communicate: to communify who we are, where we are. While there are several pieces already available and some already in use, the puzzle still hasn’t been pieced together into a comprehensive picture. It is exactly that picture we seek. The slogan I return to again and again is “Our community is content-rich, but distribution-poor.” Share the wealth. The “information highway” is a hot topic in the media, but how does it apply to Chattanooga? It’s true that almost everything we hear today about the convergence of the media, or the information infrastructure, or that information highway, is either vague or an over-burdened analogy. We can see parallels in our history: the distribution of electricity in the 1800’s and 1900’s, the marketing of automobiles at the beginning of this century, and the push for television some fifty years ago. Each of these events were misunderstood at first, mainly because they represented such a divergent change from the status quo. And in a way, each of these milestones are comparable to today’s hue and cry for “increased bandwidth:” simply put, things are getting more useful. Today, the primary target is not “electricity in every home,” or “a car in every driveway,” or even “a channel for everyone to watch”–these represent goals mostly met. Today’s target is information. Our community is content-rich, but distribution-poor. We may have as many providers of information as we do types of information, just as any community; the diversity and the quantity of “where information comes from” and “what kind of information it is” are staggering. Think for a moment on the resources of the Chattanooga area: the arts, the educational community, the governments, the libraries, the health and fitness areas, the environmental concerns, the historical aspects, the civic ventures, the tourist attractions, the commercial interests, religious groups, communication media, special interests, and the financial community–to name just a few. Each organization moves along its separate path, intersecting with other paths from time to time. Currently, the creation of a new pathway of communication (say, if ABC Organization wants to keep in touch with XYZ Corporation) requires a road to be built from scratch, often at odds with other “cooperative” roads. As a result, many of our valuable community resources are trapped, with limited access. How can these resources communicate with each other and with the public? …a model that is inclusive, accessible, comprehensive, practical, secure, efficient, and effective. This is more than just a laundry list of admirable qualities–these characteristics can serve as templates for tomorrow’s picture of how our community works. Inclusive… Involving the various segments of our society as well as the individual. Accessible… Able to be reached universally, with as few restrictions of any kind as possible and where applicable. Comprehensive… Reaching far and wide to meet the communication needs of the people and their organizations, via computers, video, audio, print, meetings, multimedia, and other forms. Practical… Providing a concrete service in a realistic setting. Secure… Establishing a safe and stable structure for sharing information. Efficient… Processing information with a reasonable ratio between work done and work produced. Effective… Creating a useful environment for interaction between the people of our community. Every area of our society touches on communication in one way or another,and by reaching a consensus on new ways to communicate, our community can learn to interact within itself. It’s certainly appropriate that in order for Chattanooga to succeed in any model of communication, we must, in fact, communicate. The Community Communication Project, a local nonprofit grassroots initiative, proposes that we develop a vision now for how the people and the organizations of our region will work together in the future.